As we continually bring up on Basketball For Coaches, coaching isn’t just about the x’s and o’s. We need to teach more than basketball. There are other things which are necessary to give your team the best possible chance of success. 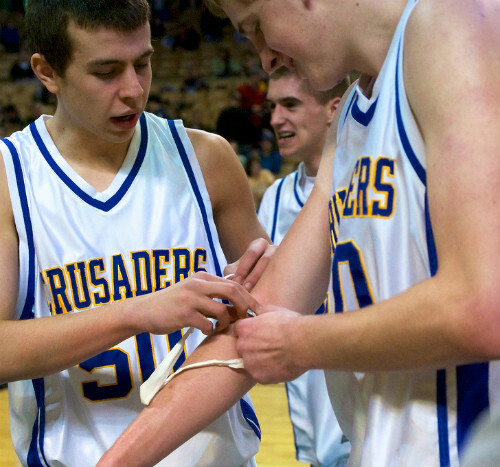 Team chemistry is one of these crucially important ingredients. Is fantastic team chemistry absolutely imperative to be a great basketball team? No. A team of highly-skilled players with poor team chemistry will more often than not beat a team of poorly-skilled players with great team chemistry. That’s just basketball. Then why is team chemistry important? 1. It will maximise their talents. Great team chemistry will enable your players to play at a higher level as a team than their current skill-set would allow. This is due to increased confidence (as a team and as an individual), being willing to work hard for eachother (dive on loose balls), making the extra pass to a teammate, holding each other accountable, and a whole lot of other positives for the team. In essence, on a team with great chemistry, the players will care more about the success of the team than the success they achieve as an individual. 2. It makes for an enjoyable season. At the end of the day, no one wants to coach a team full of players that hate each other and don’t enjoy spending time together, no matter how many W’s they put on the board. When running partner drills, take it upon yourself as the coach to put people together who wouldn’t usually choose each other. If given the chance, players will always choose the same person to partner up with. That’s not what we want. We want our players to feel comfortable with all of their team-mates. The more interaction they can have with different players, the better the chemistry on the team will be. This is especially important at the start of the season when bringing new people onto the team. Pair them with a veteran leader of the team. This won’t necessarily make them play better together on the floor. That’s what practice is for, learning each other’s tendencies and such, but doing things outside of practice will develop relationships between the group and make for a more enjoyable overall season. Just last season I coached a young player that didn’t want to come to practice because he didn’t feel comfortable and didn’t know anyone. When we started doing things outside of practice he got to know a few of his teammates and started attending training more regularly. This lead to better team chemistry for our overall group. 1. Dinner together after a game. 3. Watching a movie together. It’s all about getting players comfortable with each other. Bullying or conflict between teammates can tear a team apart. Often it will start out as a small issue between two players, but once it starts, more and more players will become involved and the issue will grow, eventually dividing the team. The key is to put a stop to the bullying immediately. We can’t tolerate that kind of behaviour. If it’s not something you can work out with the two players, get all involved and their parents together and endeavour to solve the problem before it gets any bigger. Defining roles are extremely important when it comes to team chemistry. Players want to know what to expect and what you expect from them. What do you want them to focus on when they’re out on the floor? It’s important to acknowledge the importance of all aspects of basketball when defining player roles. Many youth players believe they’re not making an impact unless they’re scoring which is completely not true. During games, make sure you’re acknowledging aspects other than scoring. I always praise a great pass that set up the score rather than the person that finished the play to encourage more unselfish passing. Coaches have to make the players that do ‘the little things’, like get 50-50 balls and rebound, know that they’re an important asset to the team. “Only 4 different techniques? Coach Mac why haven’t you included more? There’s way more than that!”, I can hear you saying it already. And you’re right. 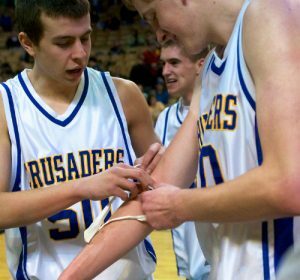 There are a lot more ways to develop team chemistry. I’ve listed 4 and now it’s your turn! Leave me a comment below listing the best technique you’ve used to bring the players on your team closer together. Let’s all help each other out with different ideas! Thanks coaches.